EU Holidays’ customers will get to experience the majestic Swiss Alps and Dubai, with its ultra-modern city and fine deserts, in one trip. As the leading specialist in Europe and USA tours, EU Holidays aims to bring a new experience to customers at every turn. This time, EU Holidays takes a step further to bring the best of Dubai and Europe to every traveller’s doorstep in a special collaboration with Dubai Tourism. With selected packages, customers get to experience the delightful combination of “two-seasons-in-one” holidays, where the majestic mountains of the Swiss Alps in Switzerland and the fine desert of Dubai are combined in one trip. Not only do customers get to fly on world-class airlines, they will also have the opportunity to stay in Dubai’s finest five-star hotels located in the heart of the city. Dubai, the most populous city in the United Arab Emirates, is a wonderful destination for families seeking an oasis of fun or couples looking for an adventure together. Step right into a winter wonderland at Ski Dubai in the Mall of the Emirates, one of Dubai’s landmark attractions. As the Middle East’s first indoor ski resort, the 22,500 sq ft arena features an 85m-high indoor mountain with five slopes of varying steepness and difficulty. Parents can be challenged by the world’s first indoor 400m “black run” [for more expert skiers] while children can have a ball at the Snow Park with an icy body slide, climbing towers, giant snowballs and an ice cave. and record-breaking rides, including The Leap of Faith. The ride is a 9m-tall mega slide that will hurtle you down its near-vertical drop in a mere second, followed by speeding through a clear, acrylic tube surrounded by numerous sharks and cownose rays. 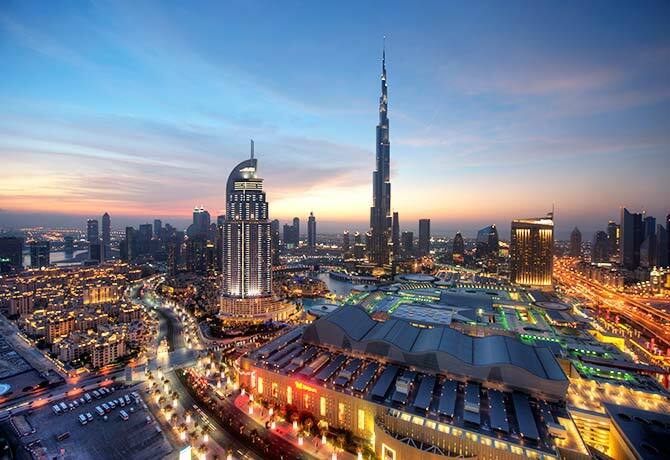 After which, kick back and shop to your heart’s content at The Dubai Mall and traditional souks. The latter offers a dazzling array of jewellery and fragrant spices, herbs and perfumed oils. 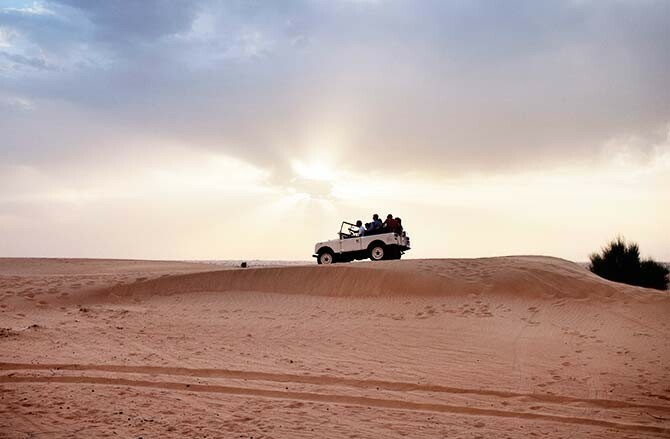 Catch the stunning orange sunset on top of a sand dune in a desert safari tour. Whether you’re looking for a romantic getaway or a high-energy line-up of activities, you’ll find it in Dubai, with EU Holidays. Explore Al Fahidi Historic District with your loved one as you take a stroll through the narrow lanes and tall wind towers in the old Dubai district. For a moment of solitude with your partner, take part in a desert safari tour, where you will be able to sit at the top of a dune to catch the stunning orange sunset. Then, enjoy a romantic dinner in the dessert at Bab Al Shams, a desert hotel known for its lounges. Round off your evening with a stunning bird’s eye view of Dubai at Burj Khalifa, the world’s tallest building that is over 828m tall. Take a trip to the top in high-speed elevators traveling at 10m per second and be in awe of the unobstructed 360-degree view of the city, desert and sea. For a truly VIP experience, you can also opt to visit the Sky Lounge on the 148th Floor. En route to Europe? Consider stopping over at Dubai, the fastest-growing transit hub in the world. Make the most of your short stay by shopping at The Dubai Mall, one of the world’s largest malls and home to 1,200 shops. If you have more than half a day to spare, you can even enjoy a traditional Emirati meal at The Sheikh Mohammed Centre for Cultural Understanding (SMCCU) in Al Fahidi. Located in the Al Bastakiya trading village, the SMCCU organises meals with local flair, which allow you to chat with an Emirati host about UAE culture, customs and religion. For more information, visit EU Holidays at Chinatown Point, 133 New Bridge Road, #03-11/13/14/16A or www.euholidays.com.sg,or E-mail enquiry@euholidays.com.sg.